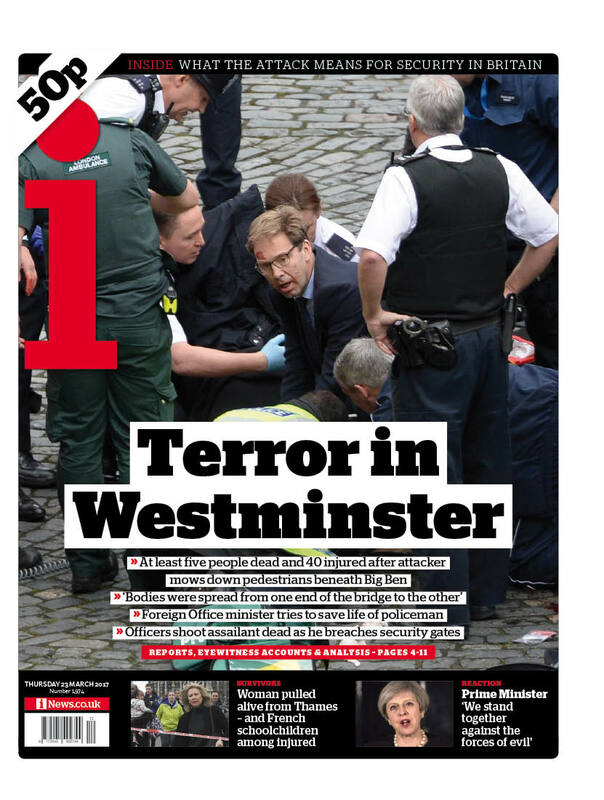 Like thousands of others I followed the evolving terror attack in Westminster glued to Twitter and flicking between Sky News and the BBC. It is on days like this when I still miss being in the newsroom. 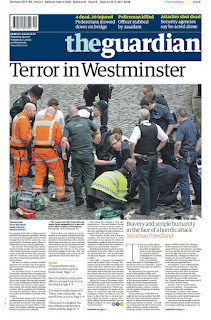 But despite the digital and broadcast saturation, there is still an crucial role for the newspapers. 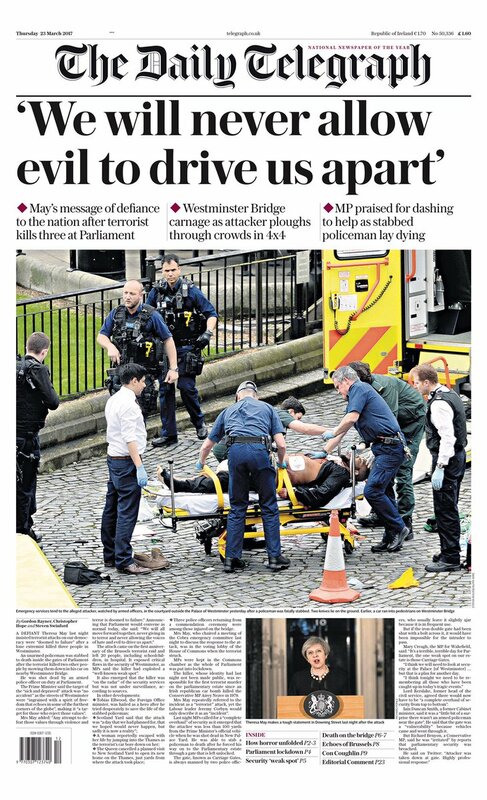 They may no longer break the news but the analysis, the comment, the perspective and the in-depth writing is to be found in print. 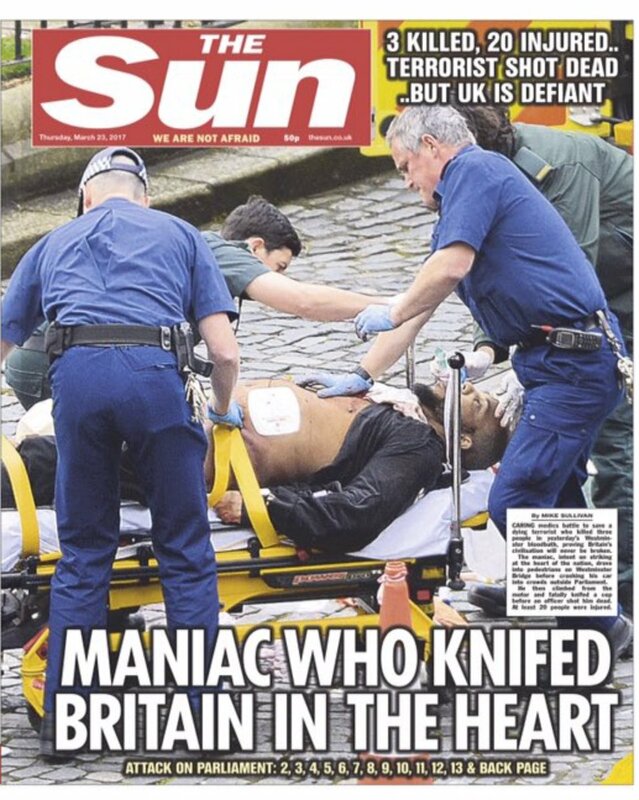 There are also, inevitably, some compelling front pages. 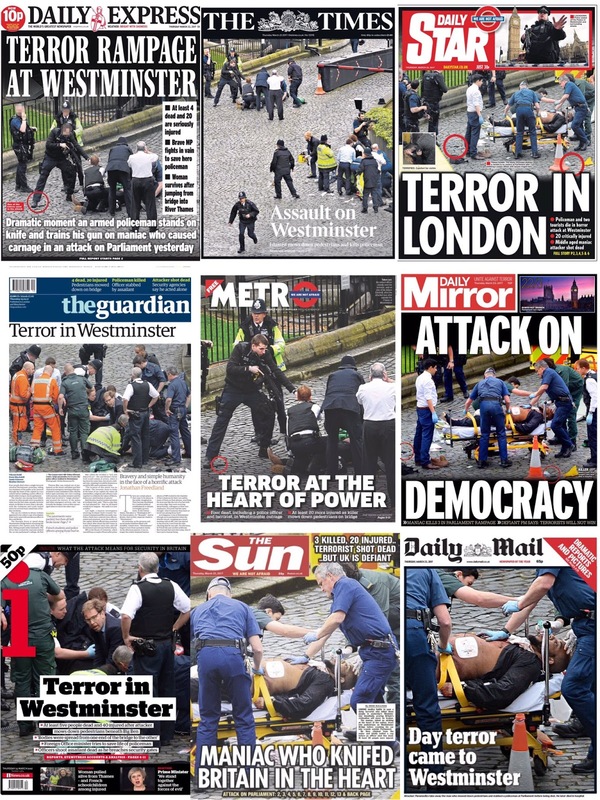 There are also some very powerful photographs and it must have been a tough call in the newsroom choosing which to use. 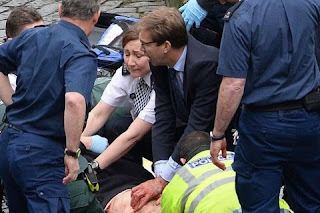 It is close but the defining image for me is the picture of a bloodied Foreign Office minister Tobias Ellwood giving CPR to a policeman. It is a stunning image. 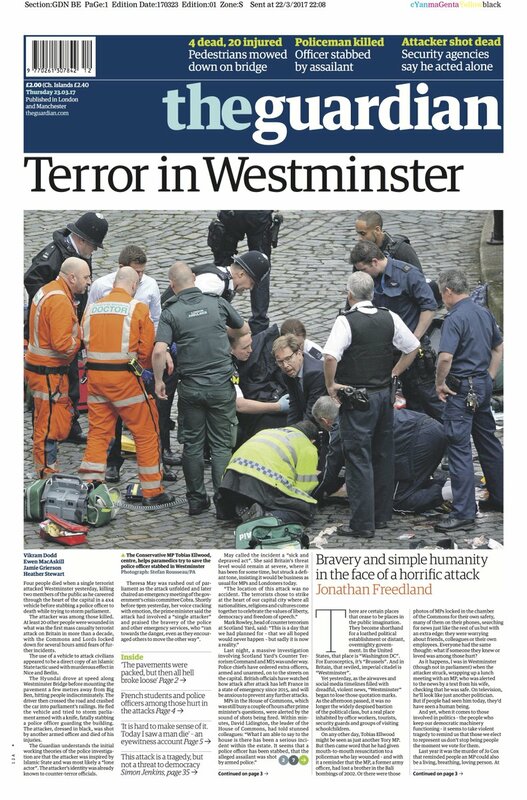 The Guardian certainly thinks so too and uses one of the Ellwood images on its front under the headline Terror in Westminster. The Sun is particularly powerful. 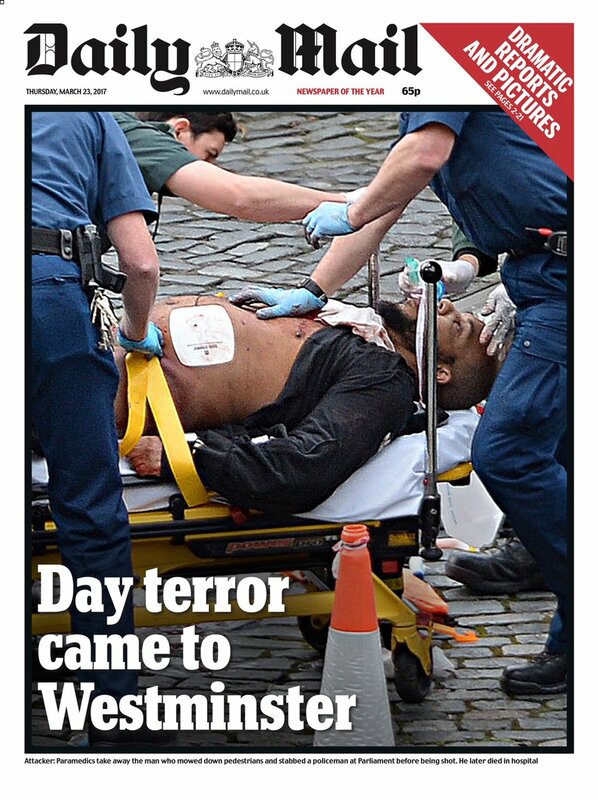 It chooses the image of the dead or dying terrorist on a stretcher on Page 1 but uses the Ellwood picture on the back. 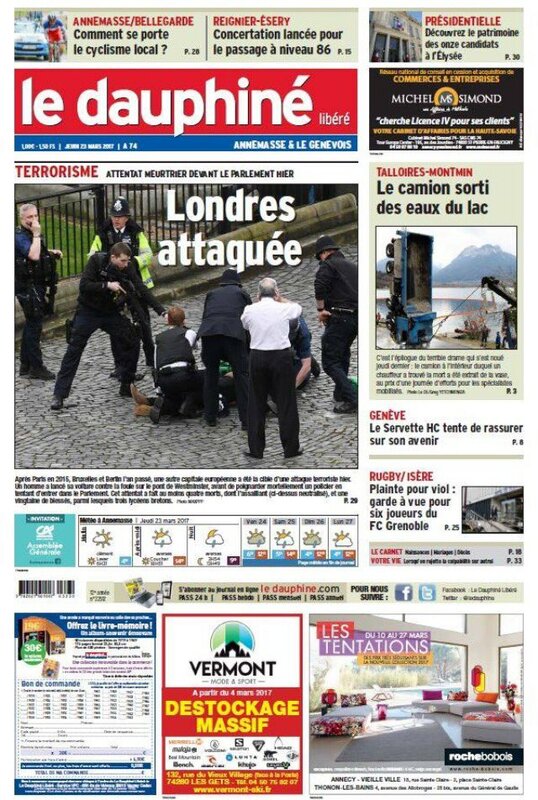 The paper focuses on the individuals - the attacker and the policeman. 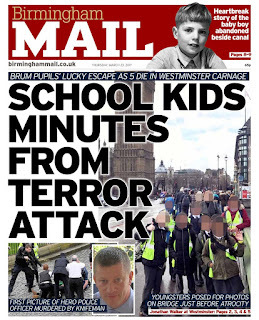 Both images are used as full page wipe-outs. Coverage worthy of the story. 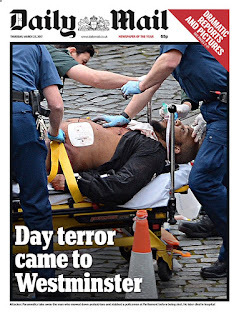 The Daily Mail also goes for the terrorist and has the strongest crop. The power of coming tight in on the image is evident. 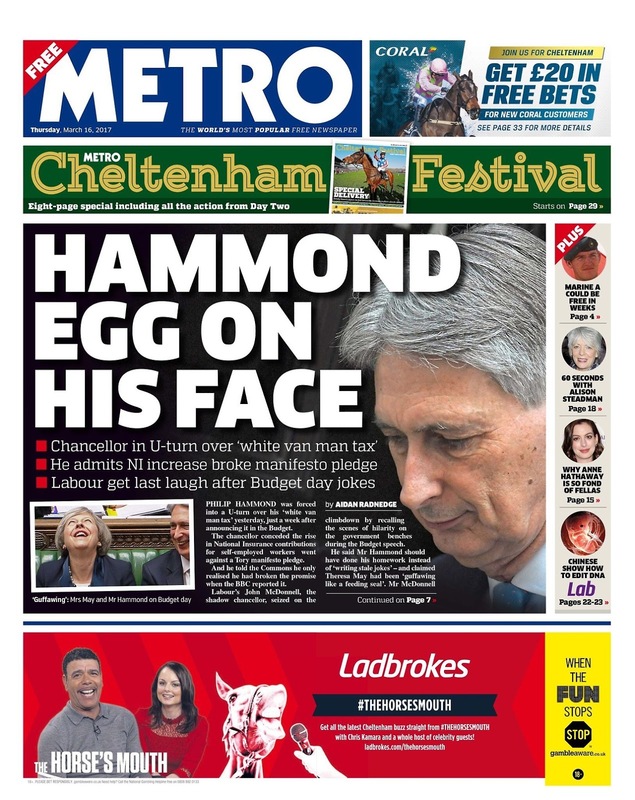 It also uses the picture at the top and the headline at the bottom ... the right way round. The other compelling image is that of the terrorist on the ground, a policeman holding a gun to him and two knives on the pavement. 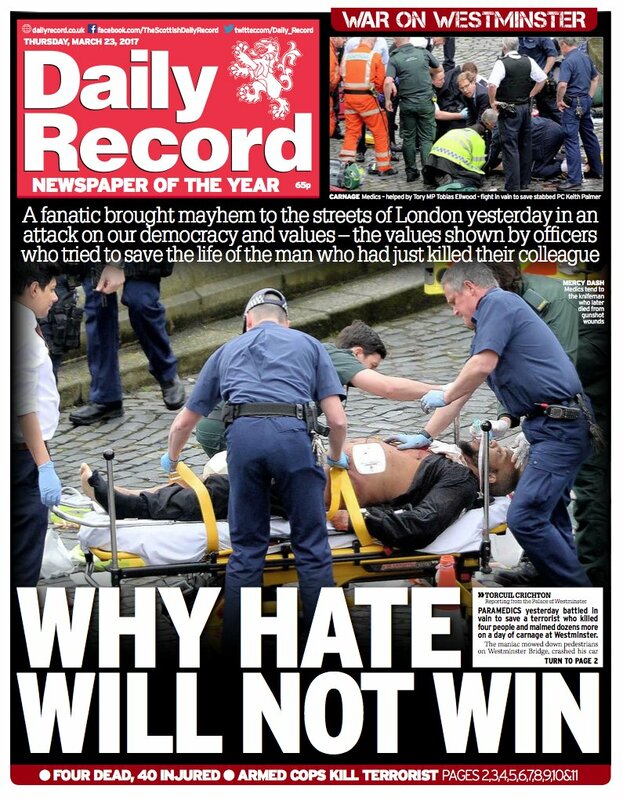 This is favoured by Metro which adds the 'We are not afraid' slogan to its titlepiece. 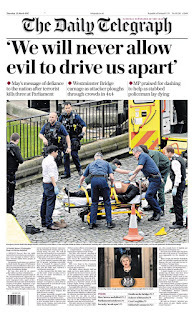 The Times takes the opposite approach. 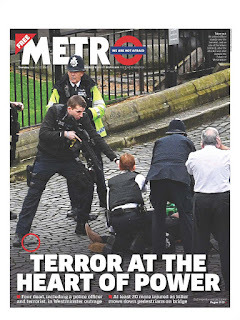 It is the same picture used by Metro but instead of zooming in on the policeman and attacker, it sets the scene. 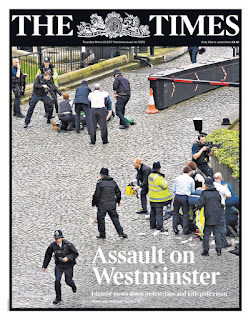 Look at the policeman running. 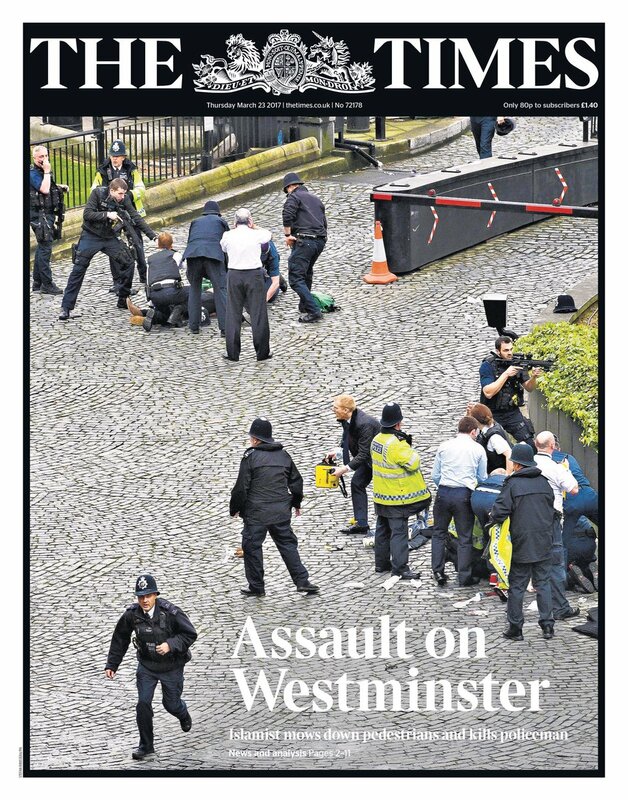 The photograph captures a sense of perspective ... and chaos. There may be a lot of cobbles but it works. 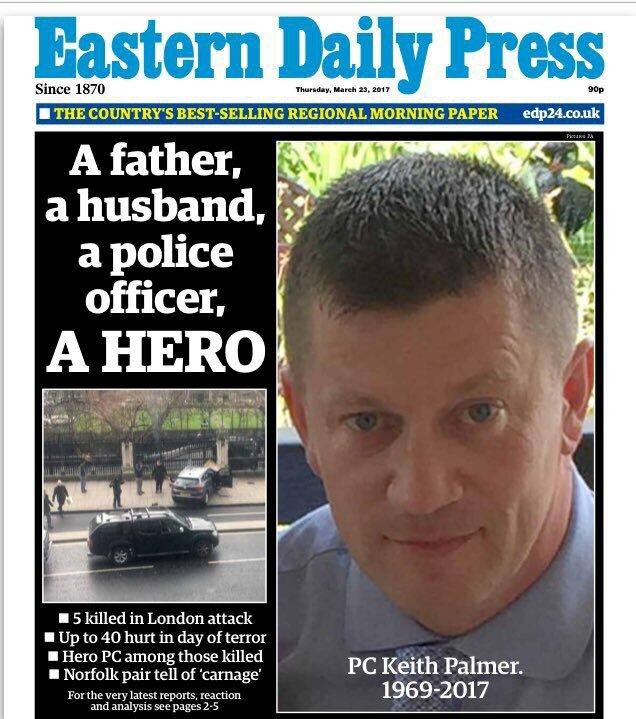 The Eastern Daily Press makes a late change once the dead policeman, Keith Palmer, was named. 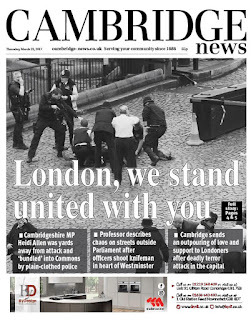 A very sad and strong front. 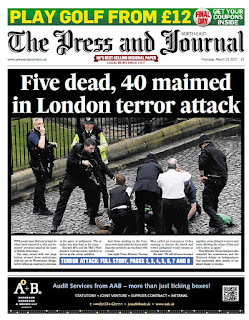 The Press and Journal uses a different crop on the picture used by The Times and Metro and updates the number of people who were killed. 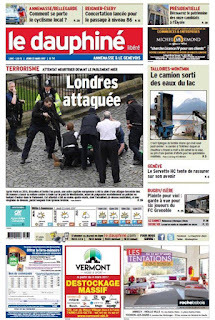 The regional newspapers also see the power of the Ellwood image. The Daily Echo in Bournemouth and the Yorkshire Evening Post are among those who go with it. 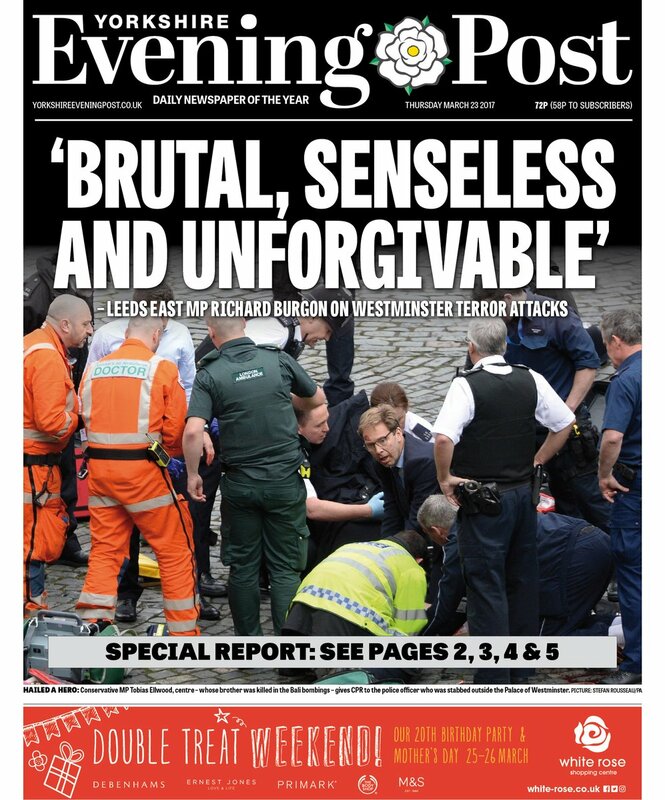 Strong headline in the YEP too. 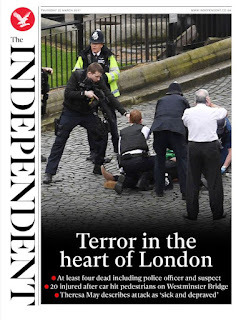 In the heat of the moment the i newspaper used a graphic picture of blood trickling from a man's boot. It was a brutal image which I won't show here. 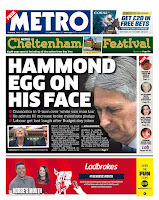 The paper soon changed its mind though and produced an 'improved' front page with the Ellwood image. Good call. 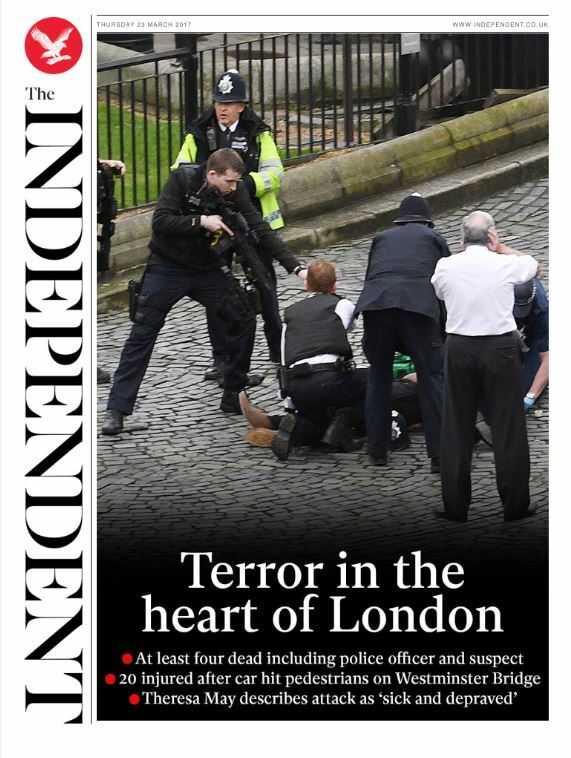 The digital Independent goes for a similar approach to Metro - the image, headline and bullets look familiar. 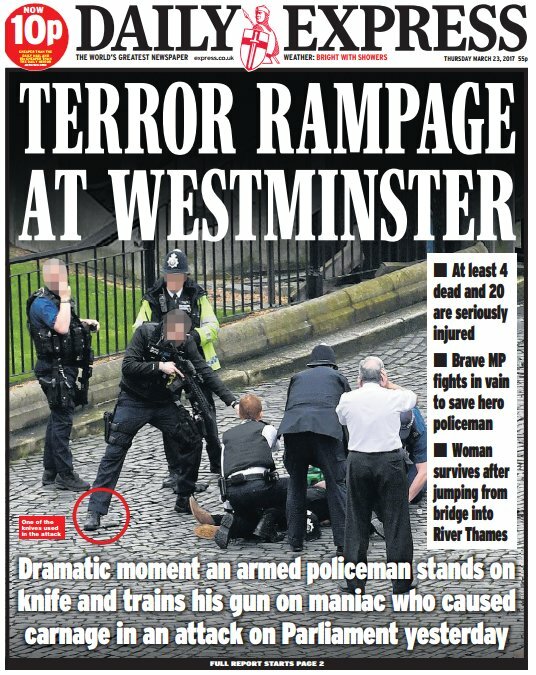 The Daily Express also goes for the same image, muzzing the faces. 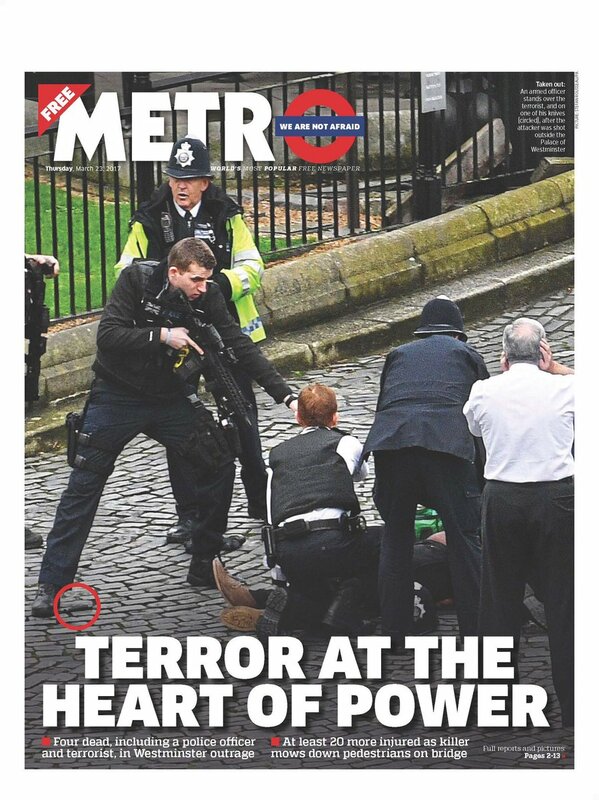 It might have cropped a bit tighter and sky-ed the picture ... but a strong image nonetheless. 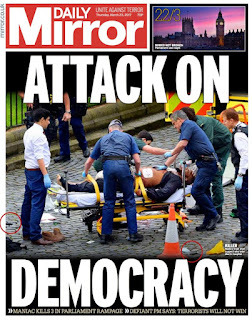 The Daily Mirror also has the image used by the Sun - the attacker dead or dying on a stretcher in the street - and a powerful headline too. The Mirror's sister Paper the Daily Record uses the same image but crops it tighter and goes for a different headline approach. 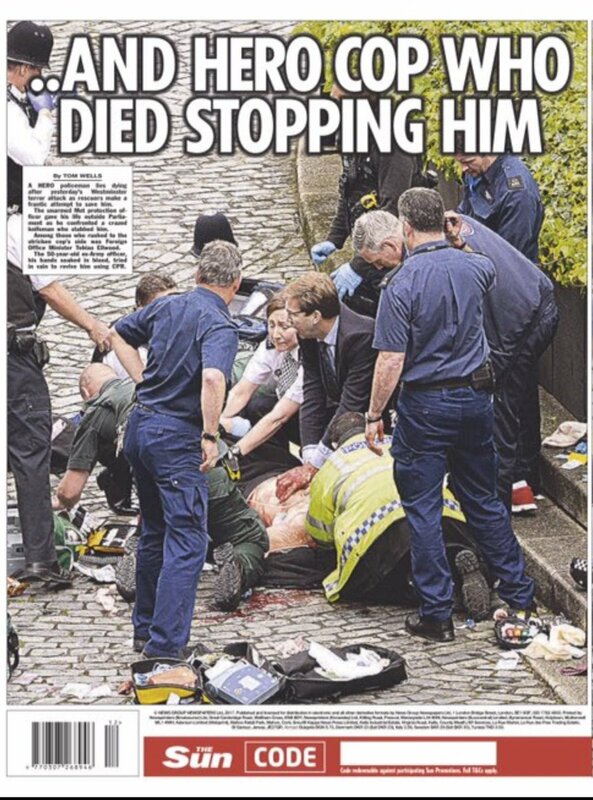 The Daily Telegraph also goes with the stretcher picture - full width of a broadsheet - but it is driven under the fold by the headline and the bullets. It might have pushed it up the page. 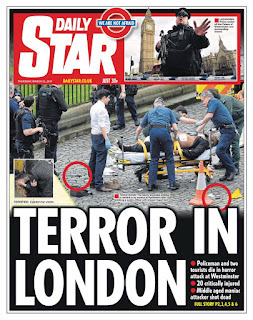 The Daily Star uses the image at the top and, like Metro, adopts the 'We are not afraid' slogan. 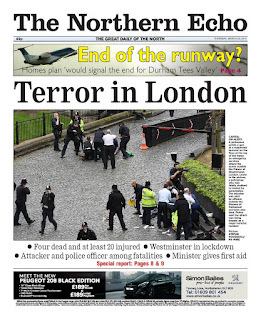 My old paper, The Northern Echo, takes a similar approach to The Times but crops a little tighter. The Cambridge News goes for an interesting angle ... solidarity with the capital. Not sure why they have done it in black and white though ... especially as the advert is in colour. 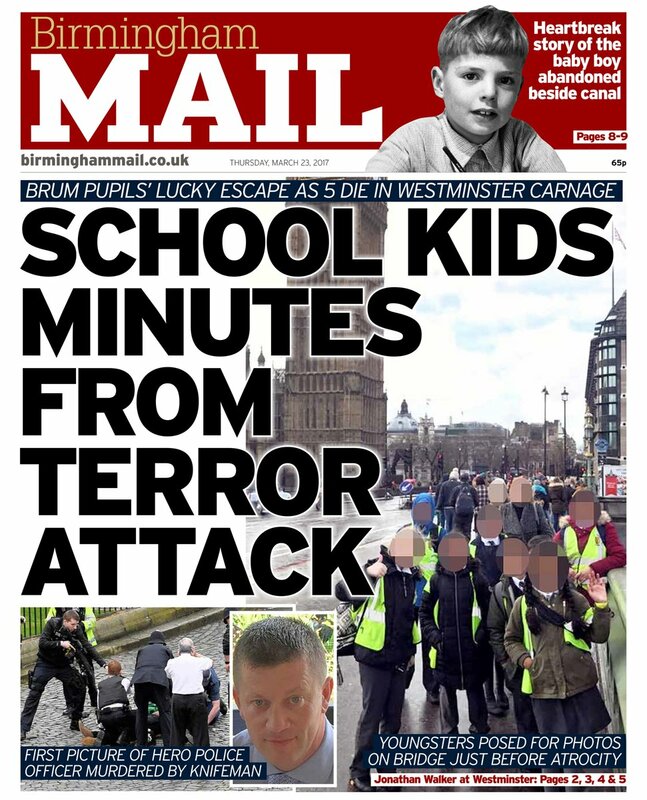 The Birmingham Mail goes for a strong local angle. 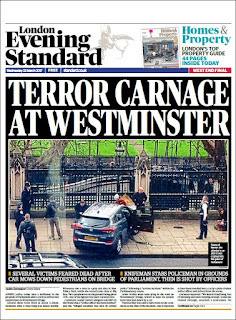 The Evening Standard rightly ran a late edition, showing the crashed car on Westminster Bridge. 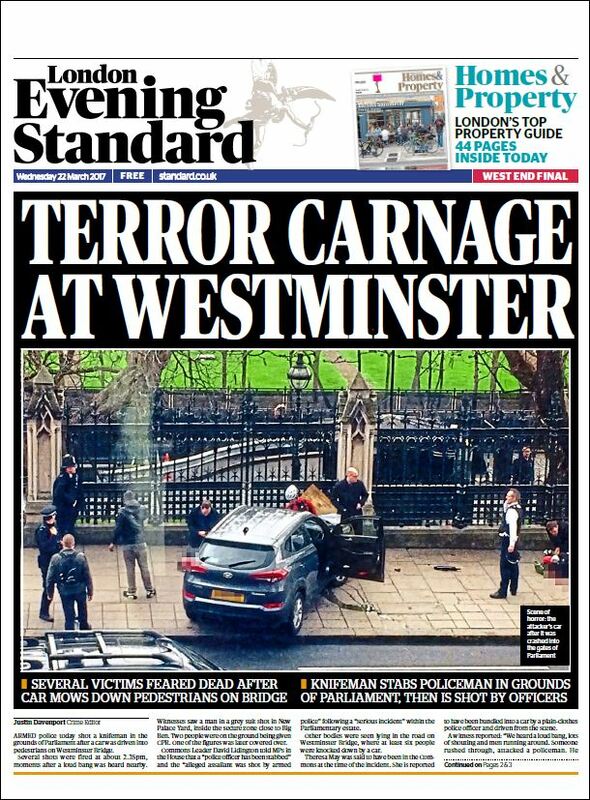 Had it happened in two months time I guess the editor would have been locked down in the House of Commons rather than in the newsroom. It doesn't matter though - his team know what they are doing. 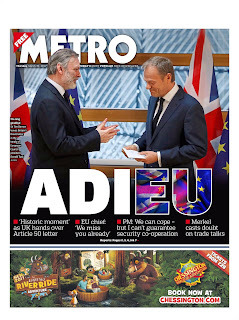 Metro also put together an afternoon online newspaper - free to download. Quick-thinking and a nice job. 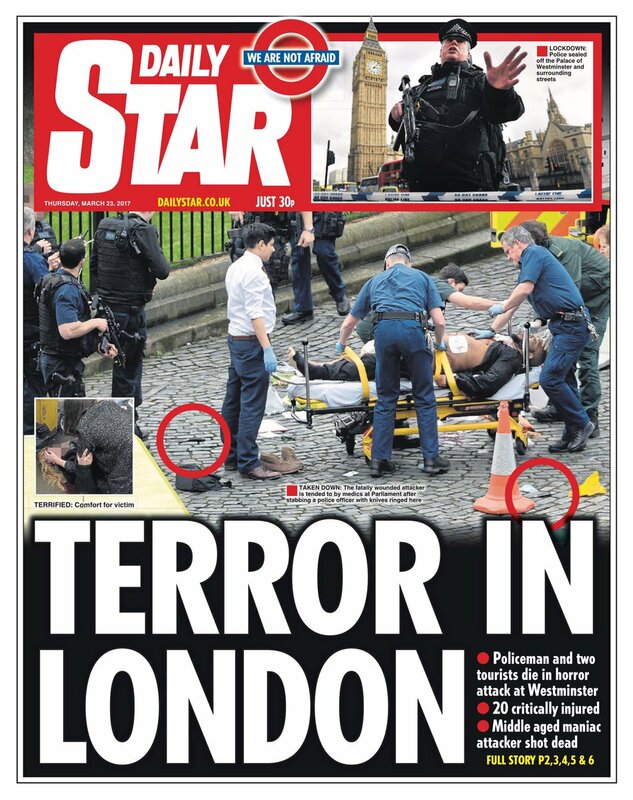 The story stretches across Europe too - although the papers don't quite capture the drama in the same way. 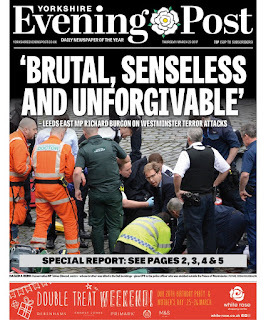 It has been a terrible day of tragedy, stoicism and heroism. Well done to the emergency services, to Tobias Ellwood, to the doctors and nurses St Thomas' Hospital and to those who kept us informed. 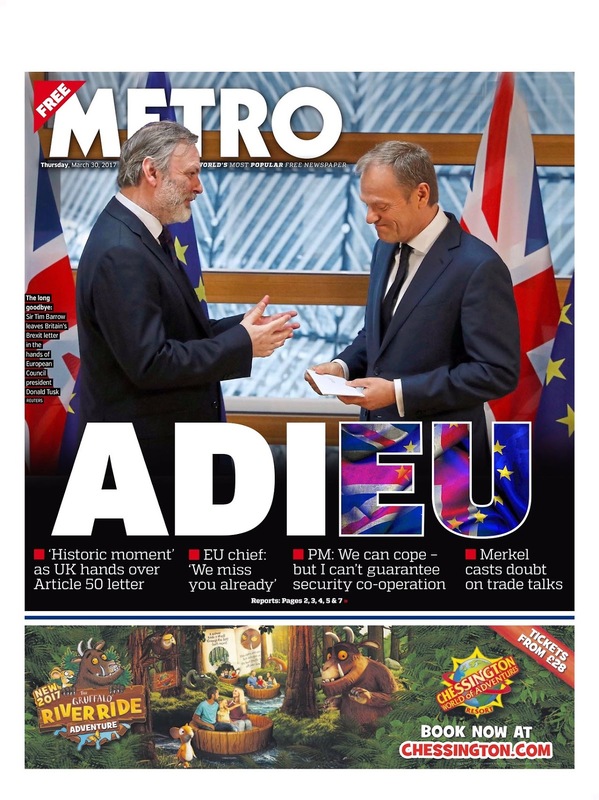 Thanks, as always, to Tomorrow's Paper's Today. 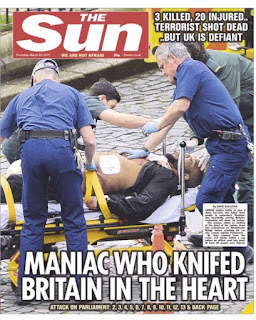 Last week's newsquiz was clearly a challenge with the top score a modest 15 by Liz Gerard. The Batstone Partnership (Adam and Lucy) scored 13 as did Chris Lennon. Here is this week's quiz. As usual 25 questions about the week's events. Let me know how you get on. 1. Theresa May said 'now is not the time' for what? 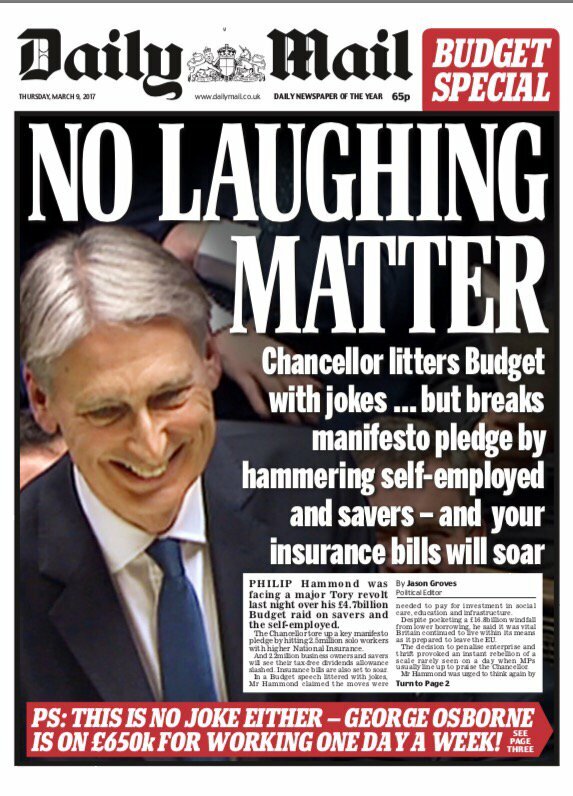 2. Who did Chancellor Phil Hammond ‘credit’ as the first person to point out that raising National Insurance contributions for the self employed was breaking an election manifesto promise? 3. Turkey's president Recep Tayyip Erdoğan called the Dutch 'Nazi ______.’ What is the missing word? 4. The Home Office has given an extra £85,000 to extend Operation Grange to September this year. What is Operation Grange? 5. Six BBC crew members were among ten people injured on which island? 6. Which company launched a free app called Order & Pay? 7. What will Noel Fielding and Sandi Toksvig be doing together? 8. 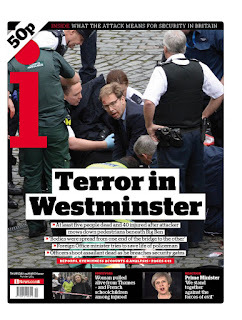 Which UK newspaper was voted Newspaper of the Year? 9. Whose photograph was used by Las Vegas airport on a poster about its new maintenance work? 10. What event prompted Angela Merkel to say it was 'a good day for democracy’? 11. Why was 17-year-old Kylian Barbey in the headline? 12. Families hid when which animal escaped from its cage and went on the run at Port Lympne wildlife park in Kent? 13. Ilich Ramirez Sanchez, known as Carlos the Jackal, appeared in a French court accused of throwing a hand grenade into a shopping area in Paris. 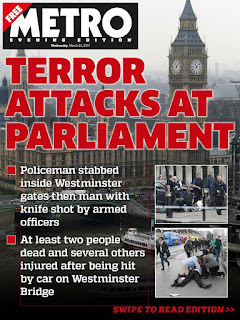 In which year did the attack take place? 14. Video emerged of Prince William dancing during a lads’ ski trip in which resort? 15. Twelve police forces have passed files to the Crown Prosecution Service over allegations that up to 20 Conservative MPs did what? 16. Who rode into racing’s record books with the first-ever Cheltenham Festival four-timer by a jockey? 17. 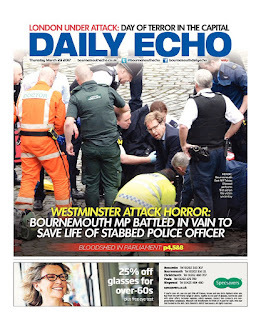 A 25-year-old man died from stab wounds after he and a friend were attacked by a man on Sunday morning in which town? 18. Whose conviction for murder was downgraded to manslaughter by the Appeal Court? 19. What did communications intelligence agency GCHQ say were 'nonsense, utterly ridiculous and should be ignored’? 20. What was the name of the sniffer dog that was shot dead by police after it escaped its leash and grounded 16 flights at Auckland airport in New Zealand? 21. Which country asked Facebook to help investigate 'blasphemous content' posted on the social network? 22. Which four teams reached the semi-finals of the FA Cup. Half a point for three, one point for all four. 23. Who is Marks & Spencer teaming up with to launch a ‘Frazzled Cafe’ in 11 stores across the UK? 24. Which company apologised after a tweet appeared on its official account that read '@realdonaldtrump You are actually a disgusting excuse of a President and we would love to have @BarackObama back, also you have tiny hands’? 25. Stunned viewers took to Twitter when a 'totally shocking' word appeared on the screen for around ten seconds during ITV’s 6pm news bulletin. What was the word? Last week's newsquiz was a bit tougher with the scores coming in much lower that usual. Mike Lowe was again top with 16.5, ahead of Liz Gerard and Ted Ditchburn on 15 while the Penman Partnership scored 14. My mates in the Plough managed a not-so-impressive 12 on Friday night. Here's this week's quiz. As usual there are 25 questions about the week's events. Let me know how you get on. 1. 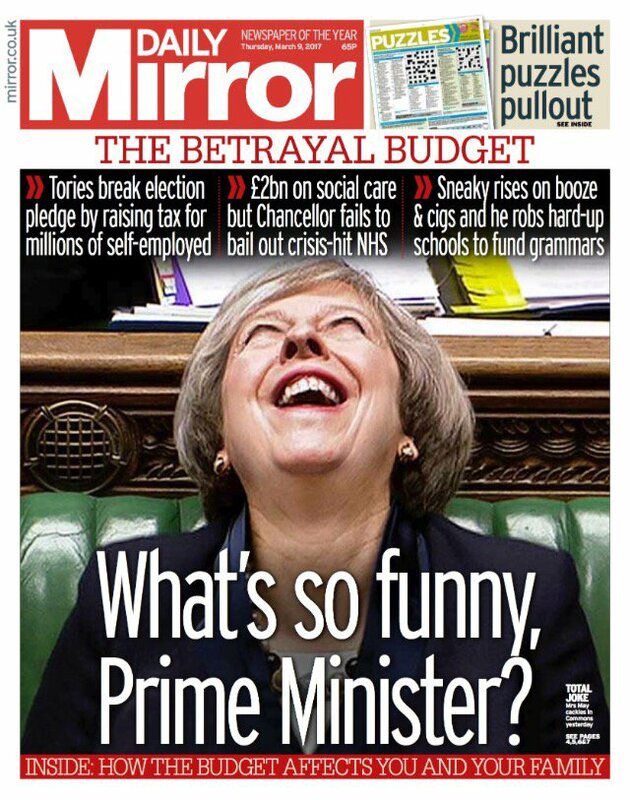 In the Budget, Chancellor Philip Hammond was accused of breaking a manifesto promise by increasing the main rate of Class 4 National Insurance contributions by one percent next year and another per cent in 2019. What is the current rate? 2. 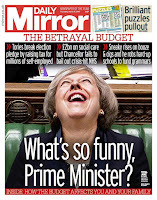 Bookmaker Paddy Power was so confident that a word would be used at least once during the Budget speech that it only offered odds of 1/100. The word was never mentioned. What is the word? 3. Philip Hammond pledged £270 million to disruptive technologies including ‘_____ _____ - a technology I believe the party opposite knows something about.’ What are the two missing words? 4. Peaches Golding became the first what? 5. What was the name of the zoo which had its licence rejected after almost 500 animals died and a keeper was killed by a tiger? 6. What was the name of the rhinoceros which was shot three times by poachers who cut off its horn with a chainsaw at Thoiry Zoo near Paris? 7. Mary Berry caused a stir be saying her recipe for bolognese sauce was to 'make it even richer by adding _____ _____. It just enriches it.’ What are the missing two words? 8. What is the name of the French group, that owns Peugeot and Citroen, which confirmed a £1.9billion deal to buy Vauxhall? 9. Which 83-year-old was sacked from an unpaid job by a woman he claimed to have never met? 10. Which US state was the first to file a law suit against President Donald Trump's revised travel order? 11. Disruption on the East Coast Line, caused by fallen power cables, forced who to pull out of BBC's Question Time? 12. 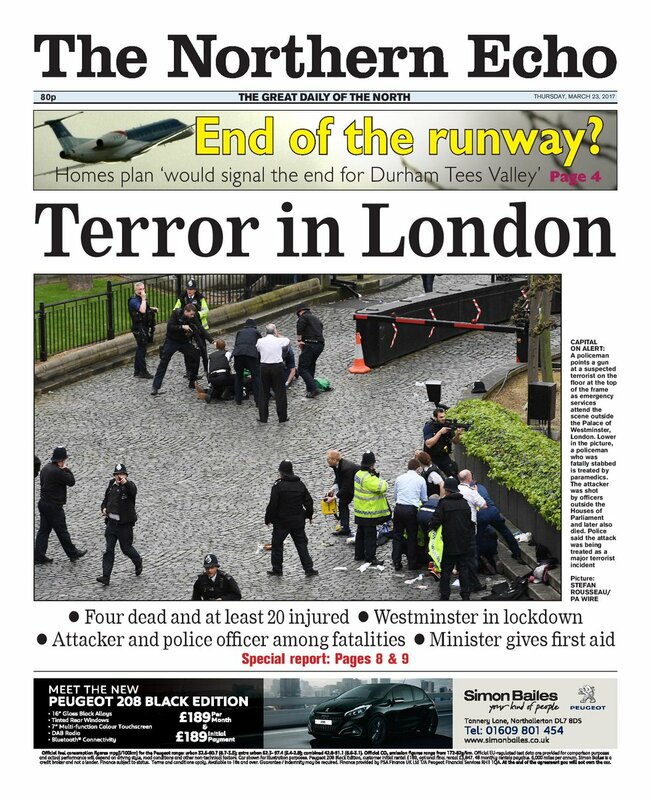 What is Durham police planning to offer free to criminals as part of an assisted treatment programme? 13. A rabbit hole in a field near Shifnal in Shropshire led to the discovery of a newtork of caves said to have been used by devotees of which religious order in the 17th Century? 14. 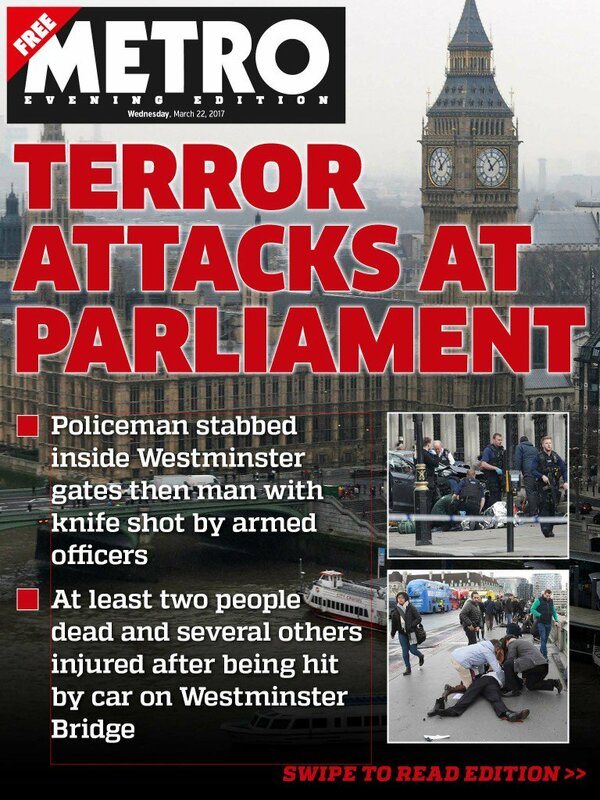 Seven people were injured in an axe attack at which city's railway station? 15. Why was Eleanor Calder in the headlines? 16. What was returned to Dover and officially given to St Mary's Church? 17. 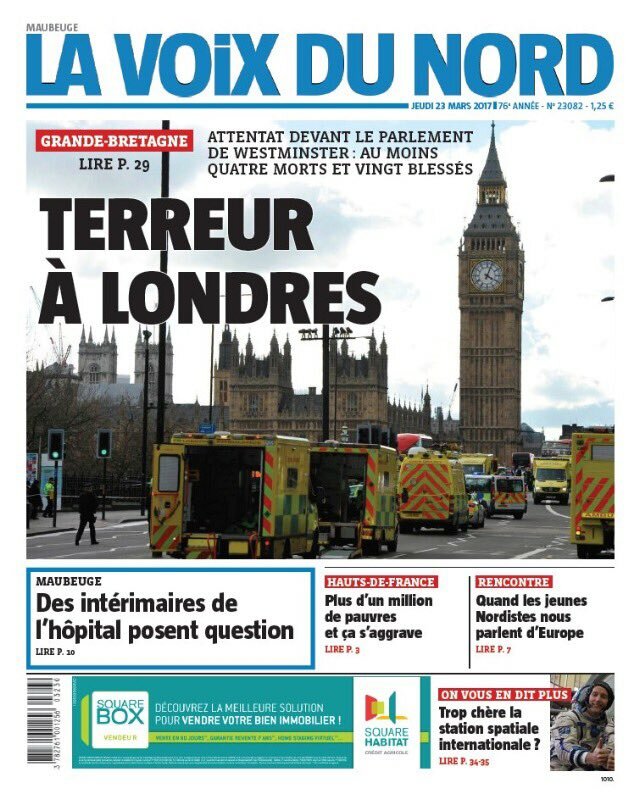 Briton Tristan Voorspuy was shot dead at his ranch in which country? 18. How many seats did Sinn Fein win in the Northern Ireland Assembly elections? 19. According to bank Credit Suisse, who poses the biggest threat to European stability? 20. Who did Facebook report to the police for sending sexualised images of children? 21. In a high scoring week in the Champions League which fixture produced the most goals over two legs? 22. A rock formation known as the Azure Window, which featured in Game of Thrones, collapsed into the sea in which country? 23. According to a coroner, whose death was confirmed as being due to 'dilated cardiomyopathy with myocarditis and fatty liver'? 24. Which supermarket chain announced it is closing 34 of its stores leaving more than 800 workers without jobs? 25. Which rock group officially called it quits by posting an image on Facebook with the dates 1968-2017 and the hashtag #TheEnd? 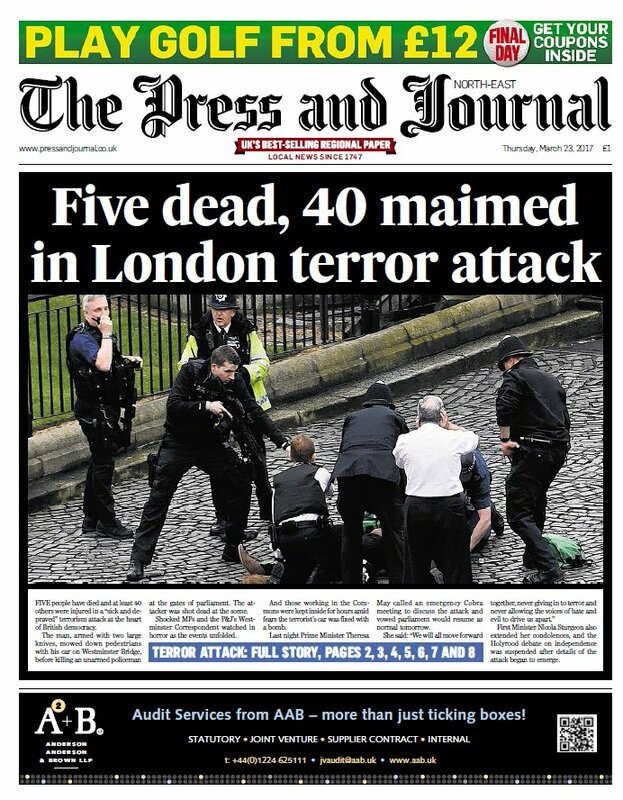 The top team score in last week's newsquiz was 20.5 by the Penman Partnership, narrowly beating their rivals, the Batstone Collective, on 19. The top solo score was a reticent Mike Lowe with 20, just ahead of Liz Gerard on 18. These are very good scores - so top quizzing. Well done. Maybe the quiz needs to get tougher. Anyway, here are 25 questions about this week's events. Give it a go and let me know how you get on. 1. 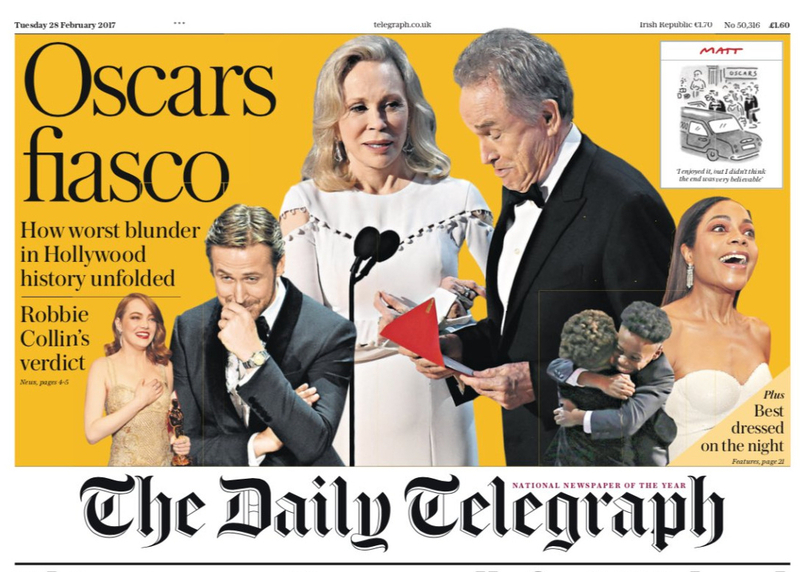 Name the two accountants who were fired from the Oscars and later given bodyguards after the Best Film mix-up. 2. Casey Affleck won the Best Actor award at the Oscars for which movie? 3. 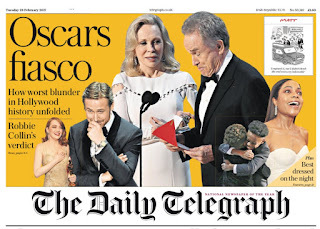 Whose death came too late to be included in the ‘in memoriam' montage at the Oscars but was mentioned by a tearful Jennifer Aniston? 4. The House of Lords voted in favour of amending the Brexit bill by a majority of how many? 5. Who caused gasps in the House of Lords when he accused peers of 'thinking of nothing but the rights of foreigners’? 6. 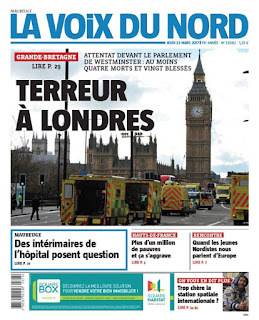 Lawyers said that relatives of the British victims of the Tunisia terror attack are planning to sue which tour operator? 7. Parents have criticised schools for banning oversized brightly coloured hair clips known as what? 8. Ken Dodd was knighted by the Duke of Cambridge at Buckingham Palace this week. How old is Ken Dodd? 9. Waterstones opened stores under different names, leading to accusations it is posing as independent bookshops, in three towns. Name the towns? Half a point for two, a full point for all three. 10. He was born in Leeds, was a political writer for the Daily Mirror and the New Statesman and served as a Manchester MP for 47 years. Who is he? 11. John McDonnell, the Shadow Chancellor, warned that the Labour Party’s existence is at risk, saying: 'We have to alert party members and supporters that the ___ ____ is underway.' What are the missing words? 12. HM Inspectorate of Constabulary reported that most police forces in England and Wales were good but that one was outstanding and one was inadequate. Name both. Half point each. 13. How much will the TV licence fee be when it increases next month? 14. According to a Downing Steet spokesman what has Theresa May given up for Lent? 15. A ‘Lisbon Lion’ who scored in the first ever European Cup final victory by a British club died this week. Who is he? 16. Which railway station has been closed since Tuesday after a retaining wall collapsed? 17. Actor Ricky Tomlinson claimed Richard Whiteley was a spy because he presented a documentary in 1972 that was 'designed, written, made and paid for by the security services'. What was the documentary called? 18. Sir Philip Green is to contribute how much money to the BHS pension fund? 19. President Donald Trump has defended 'an honest man' amid calls for him to quit. Who was he referring to? 20. What did Nicola Bailey do that led to an appearance before magistrates in North Staffordshire? 21. Newly-appointed Michelle O'Neill led which party into an election this week? 22. 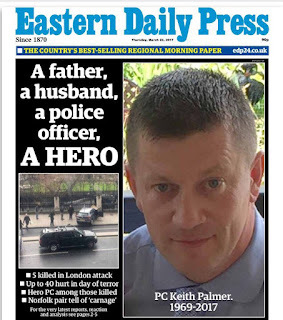 Why was Darren February in the headlines? 22. Whose credibility, according to Parliamentary Select Committee chairman Damian Collins, is in tatters? 24. John Major said this week that 'a lot more _______ and a little less cheap ______ would do much to protect the interests of the United Kingdom’. What are the two missing words? Half a point for each. 25. A train was stopped at Potters Bar, Hertfordshire, after what were being flung around a carriage by rowdy passengers who then started fighting?